The SciTemp single use temperature sensors provide high precision temperature sensing capabilities in a compact, disposable package at a low price point. Temperature control is a vital part of any pharmaceutical process, by using single use temperature sensors, you can detect any changes as and when they happen. The highly sensitive temperature sensors, provide an accuracy of +/- 0.5 °C in the 4.00 to 70.00 °C range, with an operating temperature range of -40 to +150 °C and a temperature resolution of 0.01 °C. 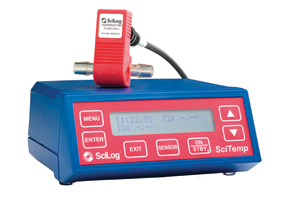 Each sensor is pre-programmed and barcoded with a unique ID for easy traceability and data documentation when combined with the SciLog SciDoc software. 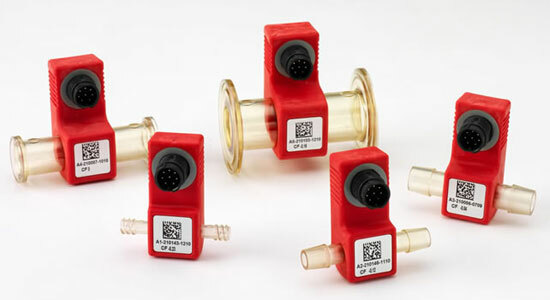 Factory calibration data is also stored on each sensor's chip for out-of-box, plug and play use. The SciTemp comes in 5 different sizes to fit a variety of tubing sizes: Luer, 3/8" barb, 1/2" barb, 3/4" Sanitary, and 1.0" Sanitary.